Poor Hands (Booker & Cash #3) came out last weekend. Initial feedback is encouraging. I’m sure I’m no different to any other writer in that I care what readers think of what I produce. I particularly care what my regular readers think of what I write, especially when it’s in a series. Part of the reason for this blog post is to offer my sincere thanks to all readers, old and new, who have downloaded a copy of Poor Hands. And if you’ve gone on to read and enjoy it all the better. And if you’ve then left a review on Amazon thank you again. At the risk of sounding like a broken record, it’s my opinion that writers are nothing without readers. 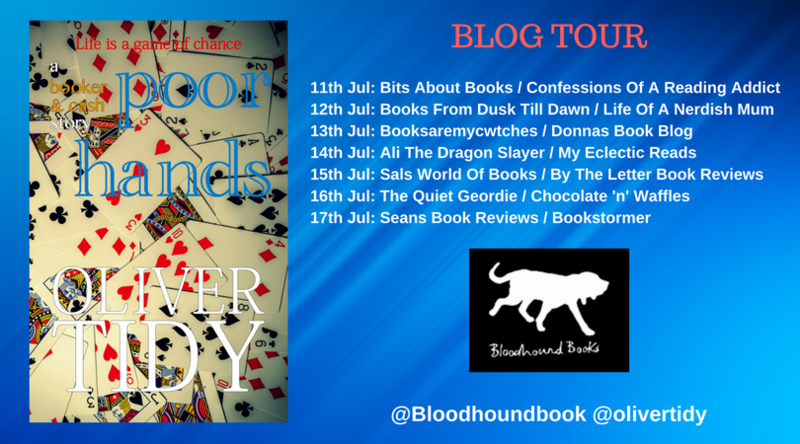 I’d also like to offer my thanks to a raft of book bloggers who took part in the book’s blog tour, organised by Bloodhound Books. Thank you for your time, trouble, kind words and mentions through your social media reaches. These guys regularly and tirelessly help to promote new writing, often from lesser known authors like myself. Their social media sites are well worth checking out. I’ve been back home on Romney Marsh for a little over a month. I haven’t written anything new because I’ve taken on a house renovation project. That is taking up all my days and leaving me too tired to do anything remotely thoughtful or creative in the evenings. I can’t see it being sorted anytime soon. I’ve also bought myself a big telly and subscribed to Netflix, which together are proving something of a distraction. It’s too easy to spend my downtime vegging out on the sofa. Some of you may remember seeing photos of this under construction last summer. I couldn’t have made it without my little helper. I’m sitting in it now. It has a good ‘feel’. It’s quiet – peaceful. There is birdsong, and fresh air and light. Every now and again the little trains on the Romney, Hythe and Dymchurch railway can be heard chuffing along the tracks not far away and the breeze is carrying the smell of the engines’ burning coal in through the open window. I am comfortable here. Time to make time for writing again. First up is a book I managed to finish in its first draft before I left Turkey. It’s called The Fallen Agent. It’s not in one of my series. It’s another story that was suggested to me from an episode of Spooks. (This one is a full-length novel.) I’ll be easing myself back into my writer’s groove with a read-through and an edit. After that I intend to crack on with Booker & Cash #4. I always feel closer to those two and their unfolding journey when I’m back on The Marsh. It’s a fab book and really hoping we see more of Ben. Ooh I say Oliver – that all sounds exciting. A new book on the horizon and a place of your own to write in! Will it have heating to encourage you out there in the winter? If not, you can always chop up that time thieving telly and burn it to keep you warm 😉 I shall keep nagging you now until The Fallen Agent comes out and will crack the whip, sorry, encourage you to get on with B&C 4. Poor Hands was worth the wait, but I am not getting any younger you know . . . The Fallen Agent shouldn’t take too long. Needs a couple of home-edits and then some professional input. Then B&C#4. I’m liking the look of the Fallen Agent so I’d better crack on with re reading Booker and Cash 1 and 2 before I start on 3 do you think I’ll have time ? Thanks, Denise. 🙂 I like that you want to reread 1&2 before 3. TFA won’t be ready for a few weeks yet. Really enjoyed Poor Hands, lots of unusual twists and turns. Hope you are settling back to living in the marsh. Went to school in Rye so cycled around it a lot in my youth. Would love to see another adventure from Romney and Marsh if you find the time to knock one out. Best regards Mike . Hi Scot, Many thanks for your message. Good to know you enjoyed the read, particularly as you’re familiar with the area. I’m enjoying being back. Getting stuck into a property project at the moment so no writing going on but I hope to be back on track fairly soon.